Twelvety – Pizza Tonight on Main St.
Pizza Tonight on Main St.
As soon as I typed the title for this, I started thinking about Bob Seger. Not a bad way to start. At least I didn’t title it, “Tonight We’re Gonna Eat at Pizza Tonight”. We’ve been fans of the Pizza Tonight mobile brick oven for years. Their full-on restaurant opened a few months ago and now serves dinner. I assumed we would feel at home before we got there, but once we walked in, I didn’t want to leave, ever (except for when I got sleepy later after eating so much). 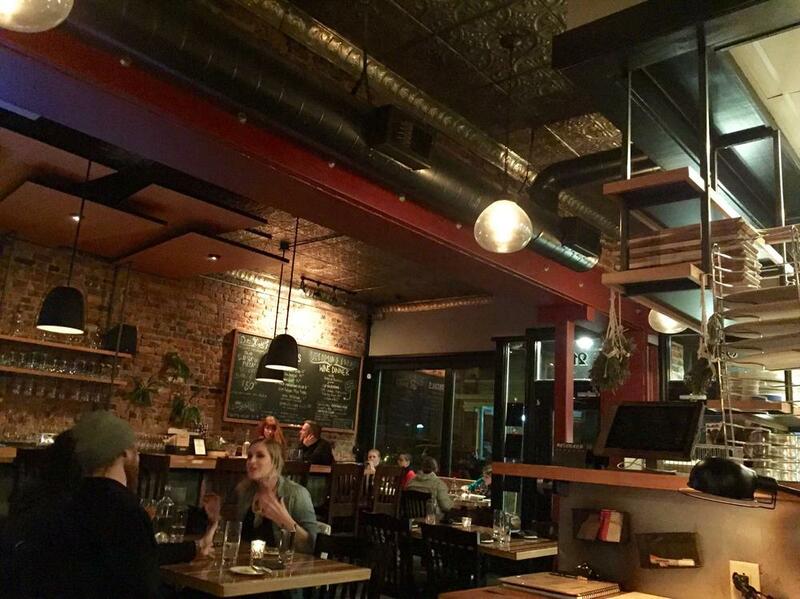 It has a lot in common with the cozy, dimly-lit, exposed brick at The Hill Cafe. The servers were attentive and friendly, and they have an excellent beer list. I believe I had a Heavy Seas Deep Six English Porter. I know the draught menu at least said “Heavy Seas English Porter”, and the Deep Six is the only one I know of from Heavy Seas. It was like having dessert first – no problem here! We started with the house-made bread, dipping it in olive oil. That’s when my Homer Simpson yummy noises started. When the pizzas came out, they were just like the delicious ones from their mobile wood-fired brick oven, only now we were sitting in actual chairs at a table in a restaurant. Mine was a margherita pizza, and Sarah’s had thinly sliced potatoes, rosemary, chiles, and Grano Padano. They’re comparable to what you would get at the wonderful Stuzzi, but a little thinner and more cooked. We loved them and put them away easily. (Not because we’re pigs, but because they were great pizzas and we hadn’t eaten much today.) No leftovers to take home! Go there and write a review on Yelp, or you know, on your own blog or wherever. Or at least just on Google, so you can increase their rating there from its current unjust 3.5 stars. I don’t get it.